The ruins of a house by the shores of the sea on the island of Eysturoy in the Faroe Islands. I’m in Melbourne thinking about my most recent trip to Europe, which was a fun and creative time. It was a very busy trip and it took a while for me to get back into the swing of things after my return. No doubt the long and difficulty of the journey home was a contributing factor to the general sense of lethargy I felt and the huge amounts of sleep I had after getting back to Melbourne. The journey home, from Berlin to Copenhagen and onto Hong Kong and Melbourne, was an insane 41 hours from door to door. The trip involved 22 hours actual flying with the rest of the time being spent waiting between flights. While that’s all water under the bridge now, it’s interesting to revisit the trip as I continue to process my photos. My journey took me to Copenhagen and Berlin for predominantly architectural photography and to the Faroe Islands and Iceland for a series of landscape photography adventures. Most of my time in Iceland was spent running a photography tour. As a consequence the emphasis was on the success of other peoples photos, rather than my own. Nonetheless, I managed to make some photos which I’II put to good use as teaching resources and also for promotion and marketing purposes. The notion of a frame within a frame is used to compose this unique image of statues perched around the beautiful Frederiks Church in Copenhagen, Denmark. Copenhagen is a very beautiful city and I very much enjoyed my time there. As it was at the beginning of my trip I spent half my time finishing off a series of work related tasks and gradually easing my way back into a daily picture making workflow. It had been a while. Fortunately the weather was great during my few days in Copenhagen and, for a change, I treated myself to several fantastic evening meals. I found a restaurant just around the corner from my hotel and, while expensive, it stayed open until around 3am in the morning. This meant that I was able to photograph into the evening, given the late hour of sunset in that part of the world during summer, have a fantastic meal and then look for night photography opportunities while walking off some of that substantial and delicious meal. Now that’s what I call living, my friend. A church and graveyard stand alone in a beautiful field in the tiny village of Saksun on the north west coast of Streymoy in the Faroe Islands. The Faroe Islands is a very interesting and beautiful country that I highly recommend to the enthusiastic landscape photographer. It doesn’t offer the diversity of landscapes that you’ll find on an extensive tour of Iceland, which is a far larger country. Nonetheless, I very much enjoyed my time in the Faroe Islands and saw almost all of the country, at least as much as what’s possible to get to by road on the main islands. But the most beautiful locales and views in the Faroe Islands, it could be argued, are only accessible via hiking into the wilderness and, while I undertook quite a few walks, I didn’t undertake any long hikes. But it’s become a priority to do so on my next visit. 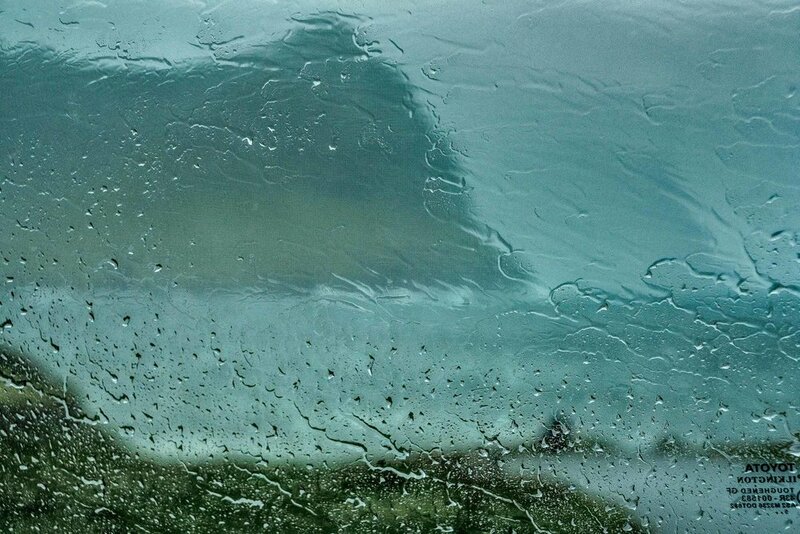 This photo was made, while sheltering in my car from heavy rain and gale force winds, in the town of Vidareidi, the northernmost settlement in the Faroe Islands. The reality is that weather is a significant factor in the success of any landscape photography trip. Despite significant energy, enthusiasm and physical effort light is essential to a positive experience of the landscape. The weather during my time in the Faroes was, as is so often the case there, quite grey and drab. I experienced no spectacular sunrise or sunsets and it rained a lot during my time in the Faroes. I also experienced several days of gale force winds, which happened to coincide with my visit to one of the countries most exposed coastlines. It was thrilling, but scary and it was all I could do to open the door without seeing it detach itself from the rest of the car. I remember laying in bed one night feeling like I'd copped a fair dinkum kicking. Still I had a great time in the Faroes, but rarely experienced the transforming and transcendental nature of beautiful light. That was a pity because I’d traveled from my base in Melbourne, Australia during a particularly grey and uninspiring winter. It’s interesting though that, despite poor weather, my efforts and hard work produced a number of pretty good images. The Faroes is an amazing place and I loved interacting with the local folk. I do plan to return for more landscape photography adventures over coming years. Colorful street art at the East Side Gallery in Berlin, Germany. I’d heard a lot of really positive comments about Berlin, which is one of the reasons I went there. But I didn’t have a great time, which is a pity as it was the final leg of my travels for 2016. I had originally planned to go to Estonia and, frankly, wish I had. Two friends (T1 and T2) from our Iceland tour ended their travels there and had a great time. Frankly, I wish I’d stayed with those guys longer. Still, I made good photos in Berlin and, despite less than optimal experiences with food, weather and my hotel I worked hard to make the most of it. I’m sure that’s not everyone’s experience of Berlin. I was at the end of a long and physically exhausting trip and undertaking long city photo walks in temperatures around 34C was not what the doctor ordered. My hotel room was boiling and, despite my fatigue, sleep eluded me. The solution was to get out into the evening air and walk myself into a more positive frame of mind. After a few days that technique worked and I adapted my daily workflow to the state where I was able to make some pretty good images. Because of the photos I made those other, tourist based experiences, are almost forgotten. What remains are the photos, and I’m very happy with them. Berlin is a city of museums and galleries. I visited most of the more famous museums and enjoyed the experience, though one began to feel much like the other after a few days of it. Fortunately (and thankfully) I was permitted to photograph in these museums and very much enjoyed doing so. I was, naturally, restricted to non tripod-based photography and was only allowed to bring a small bag into the museums. That was fine and I was happy to check the rest of my camera kit into the cloak room. It was nice not to have be carrying it and to get some cool air onto my back. Despite being busy making photos the comfortable conditions inside these venues allowed me to leave each one refreshed and ready to face the heat of the day. Just another reason to explore museums and art galleries, at home or abroad. Two beautiful Faroese horses on the island of Streymoy in the Faroe Islands. I’m looking forward to next years adventures. I’ve already booked another trip to New Zealand, my fourth, to visit Hobbiton and photograph the autumn colors on the South Island. I’m also thinking of returning to Singapore and Bali. I’m yet to travel to Japan, so that would be wonderful and, of course, I’m always hoping for a new European adventure. If I do get back to Europe next year I’II definitely be trying to get back to the Faroe Islands and Iceland. Perhaps the most exciting news is that I’m well advanced in putting together a new photography tour to Myanmar and Cambodia. RAW Versus JPEG Exposure | What's Right For You?